Find a snowplow that fits your vehicle. We also manufacture Skid Steer Plows. 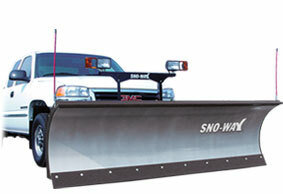 Back to the 29 Series Snow Plows page. Moldboard - 16 Ga. steel roll formed to a 14 7/8" radius, or 1/8" Polycarbonate sheet. Blades available in 90", and 96" models. Ribs are laser cut from steel. Two 1/2" plate ribs, three 1/4" ribs, and two 1/4" torsional stiffeners are robot welded to a 1/4" X 1-1/2" X 4" X 1-1/2" high strength low alloy formed bottom rail. Cutting edge - 3/8" X 6" high carbon steel C1080 mounted with Grade 5 carriage bolts. Disc shoes - Two full rotation height adjustable highly abrasive resistant shoes with integral 1" diameter steel shaft secured to blade with lynch pins. Shoe bracket is high strength low alloy steel attached to bottom rail by robotic welding. 50 degree rotation full tripping blade. Trip Springs - Two full load trip springs 2-5/16" OD X .438" diameter made of oil tempered spring steel attached with two 5/8" X 6" eyebolts. Shock absorber NOT REQUIRED due to integrated dampener system. Blade trip pivot- Two 3/4" diameter Grade 5 pins secured through 1/2" steel ribs. Blade guides - Two high visible plastic safety orange markers. Plow angling 30 degrees full left and right. Is 1/4" high strength low alloy plate formed and robot welded to create a structural channel. Swing frame is sandwiched between two plates of the A-frame which is reinforced with robot welded gussets made of high strength low alloy steel. Pump platform - robot welded formed channel plate to hold hydraulic power unit to A-frame. Plow stand - Adjustable stand by using hydraulic system to lift/lower A-frame to adjust for proper alignment with vehicle. Rolled structural 2" X 4" X 3/16" tube robot welded to a high strength low alloy 3/8" plate stop and 3/16" gusset. Angling arms are secured with 3/4" diameter Grade 5 pins through 3/8" high strength low alloy plate. Swing frame to A-frame angle pivot - 1" diameter Grade 8 supported on both ends. Lift mechanism - Robot welded high strength low alloy lift bar and bell crank to provide direct linkage to A-frame for lifting of plow. Custom designed robot welded high strength low alloy steel sub frames fastened with supplied hardware suitable to assure secure attachment. Mount design to meet Federal Motor Vehicle Safety Standards (FMVSS). Drive in mount using 3/4" heat treated pins which drop into sub frame mount and secured with two pins with loop handles and lynch pins. All snowplow components will be cleaned in an eight stage wash system, rinsed with phosphate and final rinsed in reverse osmosis water. All snowplow components will be powder painted using air to fluidize the powder and applied with a paint gun. Components are hung to an electrically charged grounded line. After powder is applied, components are run through a gas fired oven where parts are brought to proper temperature to assure proper curing of the powder. A-frame mounted Electro-Hydraulic unit consisting of a fixed clearance displacement gear pump with 1750 psi relief, direct tang driven by a 4-1/2" 12 volt DC motor. Entire unit is completely covered by a removable polyethylene cover to protect from the elements. Pump with filter screen and return tube screen immersed in a see-through polyethylene tank. Valve manifold is constructed of aluminum and contains four solenoid cartridge poppet valves for gravity system. Cushion relief valves set at 2400 psi and a changeable restrictor screw to adjust blade drop. Hydraulic cylinders - One 2 1/2" X 4" lift cylinder and two 1 1/2" X 11" angling cylinders each with a rod seal, wiper ring and gland nut. All cylinders connected to hydraulic power unit with 1/4" 5000 psi rated hoses and feature O ring fittings. Hydraulic power unit shall be controlled by a microprocessor based in cab control. Control will be equipped with an on/off switch and indicator light. Control will be programmed with a start up sequence code to activate microprocessor. Control can be used as a hand held, floor or dash mounted. In cab control will be three wire 12 Volt system connected to hydraulic power unit through a control harness. Power and control harnesses to have quick disconnects and supplied covers for storage. Control will allow snowplow to be in float when lowered and also be able to angle left/right. Unit shall be grounded to negative circuit of the vehicle. From battery, power cable will be connected to a 150 amp thermo circuit breaker. Hydraulic fluid will be low temperature, anti-foam aircraft quality hydraulic fluid with a pour point of -50 Fahrenheit. Cycle times - Lift 2.2 seconds, Angle 3.8 seconds. Hydraulic power unit to be removed from vehicle with snowplow assembly leaving a clean vehicle profile. Hydraulic Down Pressure System allows you to put additional force on the cutting edge of the snowplow. At the same time, weight is being transferred off the front axle to the rear axle optimizing your vehicles performance. A double acting cylinder is used as the lift cylinder. Two additional cartridge poppet valves, a relief valve, and electric pressure switch are added to the otherwise gravity system. The pressure switch is used to control the cutting edge force. This reactive system is activated with a switch on the in cab controller. Rectangular dual beam halogen headlamps with combination park and turn signals. Vehicle specific pre-wired harness with plug in adapter to eliminate headlamp wire splicing. Plow and vehicle headlights automatically selected through relay system. Heavy duty flasher (when required). Light kit to be full adjustable both vertically and horizontally. FMVSS 108 compliance for lights. Light kit is fully removed from vehicle as part of the snowplow assembly leaving a clean vehicle profile. All snowplow components are removed as one assembly from the vehicle by disconnecting pins and harnesses leaving a clean vehicle profile.